Steelers Legend Terry Bradshaw on Current Coach Mike Tomlin: "I Don't Think He's a Great Coach"
Steelers legend Terry Bradshaw and coach Mike Tomlin won’t be trading Christmas cards anytime soon. The Steelers coach is a win away from another AFC North Title, and this season reached 100 wins as a head coach, the fastest Steelers coach ever to reach that mark. That evidently isn’t enough for Bradshaw, who did say he thinks that former coach Bill Cowher is a great coach, but wasn’t as kind to Tomlin. “I don’t think he’s a great coach at all,” Bradshaw said. 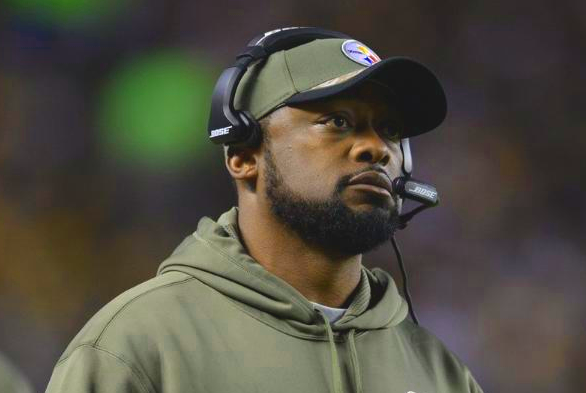 Sure Tomlin has had his issues in the last 10 seasons, but let’s give credit where credit is due – he’s never had a losing season with the Steelers, and even when the team has missed the playoffs, every season they are in the mix for playing past week 16. It would be wise for Bradshaw to amend his comments, but for now, it comes across rather weak for him to not put Tomlin in the mix as one of the great coaches in the NFL. 3 Comments on "Steelers Legend Terry Bradshaw on Current Coach Mike Tomlin: “I Don’t Think He’s a Great Coach”"
I havent always agreed with some of the things Terry has said in the past . In addition , the way he handled Chuck Nolls funeral last year was a very classless act on his part when you consider that a large number of players from those Super Bowl teams were in attendance . However in this case , I have to agree with Terry . Mike Tomlin is a good coach , hes not a great coach . If Tomlin was a great coach , he would have found a way to correct the problem of playing down to lesser opponents . A huge problem thats been going on for more than five years now . He proven hes clueless on how to fix it . Lastly , the stupid penalties for unsportsmanlike conduct , excessive celebration by players like Antonio Brown that kills this team every week would have been stopped . It hasnt . When you have all pro players at quarterback , running back , and wide receiver as well as pro bowl offensive lineman and you only have one playoff win in the last five years ? Its unacceptable . In this case Id have to say Terry is right . I agree 100%. I like Tomlin as a man but his coaching rhetoric is getting old. Making the playoffs isn’t good enough. We have to get back to Steelers football with an emphasis on discipline and teamwork. Terry must be confusing Mike Tomlin with Green..